Those big wraps made at the bottom of the small loops are particularly well done! The coiled wire work is especially attractive. The wire gauges used as 16 G and 24 G. 16 G might be a bit thick for a beginner to work with. 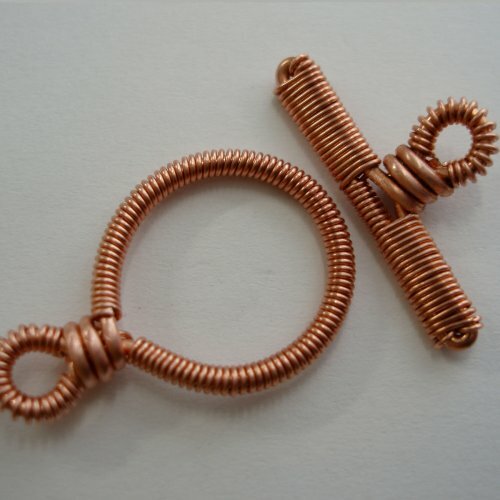 So make sure you use soft temper wire like copper. Work slowly - rushed wire work usually leads to imprecision. Also remember that wrapping with thicker wire looks better. If you are tempted to change to 26 G or 28 G for the wrapping, the final design will look finer and may not be as appealing as the toggle clasp made by the designer. Rachel Murgatroyd's tutorial is very different but lovely nonetheless. Hers is for delicate designs. The wire work here is also simpler to do with thinner, dead soft wire (18G ). You can also attempt this in 20 G if you scale down the size and are using it for light bracelets. Those are both lovely hand made toggles Pearl. The tutorials have got my brain going - which is a good thing! I'm thinking of using my coiler to make some of the coils and just slide them on - then finish with some wrapping. Yes, I agree with using a wire coiler if the dimension is right. I often do this. I never mind winter as it is the season where I get the most time to do crafts!! These are perfect examples of how, with practice and patience, you can turn plain wire into something beautiful. Making your own findings means your design will be almost all handmade and unique! That is too funny about your orthopedic surgeon's name! Mine is also perfect for what I love doing! Once again, thank you for a perfect post, Pearl. These are really wonderful thought starters.